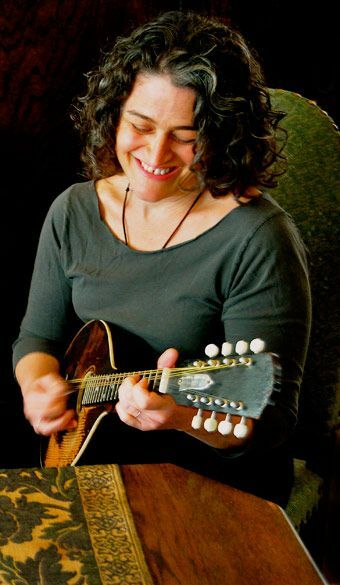 A San Francisco native, Marla is one of the prominent voices of the mandolin in Irish music. She brings a deep and distinctive sensibility to the tradition on one of its lesser-heard instruments. She is a dynamic performer and a sought after teacher. Her dynamic playing is featured on the 2017 Noctambule release A Sweetish Tune, on the eponymous Three Mile Stone recording with San Francisco favorites, fiddler Erin Shrader and guitarist Richard Mandel, and on The Morning Star, a duo CD with legendary Irish singer and bouzouki player Jimmy Crowley released in 2011 — an all instrumental project that features Irish music on an array of mandolin-family instruments: mandolin, mandola, mandocello, bouzouki, and dordan. She has performed and taught nationally and in Ireland, and was a featured performer at the 2018 Masters of Tradition festival in Bantry, Co. Cork. In addition to the mandolin, Marla plays mandola, tenor guitar, and button accordion. (She had the singular honor to be featured as Miss March in the 2011 Accordion Babes Pin-up Calendar.) She also sings and writes music, and is known for her musical settings of works from a variety of poets. In addition to playing and writing music, Marla is a textile artist. For a look at her work please click here. Marla's main musical endeavor is a collaboration with her husband, guitarist Bruce Victor, under the name Noctambule. Bruce and Marla released their debut CD together, Travel in the Shadows, in 2013, and followed it up in 2015 with The Waking. Both recordings feature poetry that they have set to music and arranged for their bevy of strings, as well as original instrumentals - waltzes, a reel and an air. In July of 2017, Noctambule released a new recording, A Sweetish Tune. This album is largely traditional Irish music, with some newer tunes written in the tradition, by Marla and by others, along with a few songs - a traditional Irish ballad, a new ballad, and a poem set to music by Marla and Bruce. Marla teaches privately, and in group classes, online with Peghead Nation, and has taught at many music camps, including The Swannanoa Gathering, Lark Camp, California Coast Music Camp, The Mandolin Symposium, Colorado Roots Music Camp, Portal Irish Music Week and O'Flaherty Irish Music Retreat. 2019 will see her return to Lark Camp, Portal Irish Music Week, and Irish weekend at The Fiddle & Pick. In addition, she will be joining the faculty at three camps that are new to her -- Walker Creek Music Camp in April, Puget Sound Guitar Workshop (Week 3) in August, and a brand new mandolin camp in New Mexico in early November - Southwest Mandolin Camp. Marla currently serves as Board President of Healing Muses. Healing Muses provides high-quality, live music to support patient care in hospitals, hospices and other types of care centers throughout the San Francisco Bay Area. The work they do is hugely important. Please visit their website and support their work if you find yourself so moved. There is a singular sound that results from the unique combination of a musician, their music and their instrument. We take that for granted with a singer, whose instrument cannot be separated from the musician, nor from the music that they make with their body. I feel it no less true for an instrumentalist, if they are fortunate to find and bond with an instrument that can become their voice. This incredible mandolin came to me through my grandfather. I remember him playing it for me, my brother and sister, and my cousins when we were children. It was after he died that I picked it up and began to learn to play it, learning to play music at the same time. I have always played this mandolin -- its voice is part and parcel of the thing that is my music - its sound is my sound. "Marla is a wonder on the mandolin; rhythmic beyond imagination, clear as a bell tone, great invention, lovely ornaments at just the right times and places, and a sureness and ease that allows the listener to relax and be carried away." "Marla’s amazing mandolin playing sets the bar for all others"